Britain's Prince Harry made an Oval Office confession to President Barack Obama on Wednesday. The prince, in town to promote the Invictus Games for wounded service members, told Obama that he'd had "huge amounts of fun" stealing the idea for the international competition from the U.S.-based Warrior Games and then "making it better and now we're giving it back to you." Obama made clear he didn't mind. The president called the international sports event -- scheduled for May in Orlando, Florida -- a way to make sure people see not only the sacrifices of wounded warriors "but also the incredible contributions, strength and courage that they continue to display." Harry spearheaded the first games, in London last year. The prince visited Fort Belvoir in suburban Virginia earlier in the day and threw down a friendly challenge to U.S. athletes interested in the games: "You better bring it, USA," he told troops and veterans. During his visit to the base, the prince, accompanied by first lady Michelle Obama and Jill Biden, high-fived two rows of wheelchair basketball players at Ft. Belvoir before making remarks that gave a royal seal of approval to programs that help injured service members recover from the physical and emotional wounds of war. Harry, who served two tours in Afghanistan, recalled seeing the brutal injuries suffered by fellow service members, and said that's when he found his mission -- to help injured veterans "lead healthy and dignified lives after service." During his stop at the base's USO Warrior and Family Center, the prince also visited art and music therapy rooms. He admired an Uncle Sam mural painted by one former service member and tapped his toes to the jazzy strains coming from a drums-and-keyboard duo of Marines as he joked, "If I played an instrument, I'd join the band." Singer and keyboard player Lt. Col. Shane Tomko of Quincy, Illinois, credited the music therapy program with helping save his life. Harry, Mrs. Obama and Biden sat courtside to check out a wheelchair basketball game, the three of them clapping and cheering for both teams. The trio and the crowd applauded as a female player who toppled out of her wheelchair was helped up by other players. 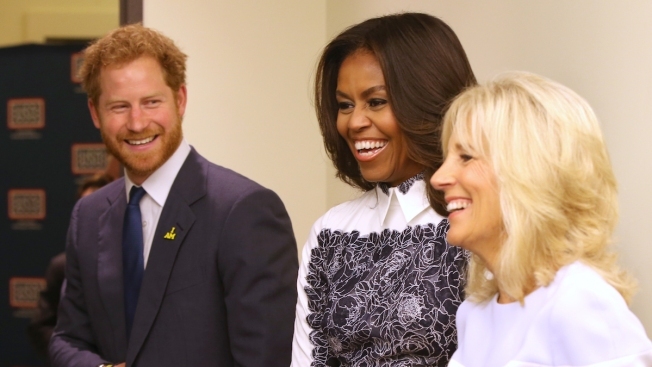 Mrs. Obama, who warmed up the crowd for Harry, took note of the excitement attached to the prince's visit, telling the crowd, "Alright ladies, Prince Harry is here. Don't act like you don't know." The 31-year-old prince, fifth in line to the throne, this summer ended his full-time service in the army and said he wanted to spend more time on charitable causes. He spent the summer working with animal conservation groups in Africa.